Cardiovascular disease remains the leading cause of death in the developed world. By preventing thromboembolic events such as heart attacks and strokes, antiplatelet drugs have become a cornerstone in the treatment of cardiovascular disease. Clopidogrel is a member of the thienopyridine family which inhibit ADP-induced platelet activation by irreversibly binding to the P2Y12 receptor. Clopidogrel is one of the most commonly used medications with over 9 million prescriptions written annually. It is utilized in the treatment of a wide variety of cardiovascular disorders including acute coronary syndromes (ACS), percutaneous coronary intervention (PCI) with stents, cerebrovascular disease, peripheral vascular disease, and structural heart interventions. Most often, clopidogrel is used in combination with low dose aspirin, providing dual antiplatelet therapy (DAPT). Newer, more potent P2Y12 inhibitors, prasugrel and ticagrelor, are now available as alternatives to clopidogrel. These newer agents have been shown to be more effective than clopidogrel in reducing ischemic events in patients with ACS. Recently a novel intravenous P2Y12 inhibitor, cangrelor, has become available for use during PCI in patients who have not been pretreated with an oral P2Y12 inhibitor. This book examines virtually all aspects of P2Y12 inhibitors – pharmacology, clinical uses, randomized trial results, guideline recommendations, and adverse drug effects. Important fundamental issues are reviewed including comparative pharmacology of P2Y12 inhibitors, randomized trials of clopidogrel in patients with coronary artery disease, DAPT duration after PCI, and role of platelet function testing. The newer P2Y12 inhibitors (prasugrel, ticagrelor, and cangrelor) receive special focus. Use of antiplatelet therapy in specific patient populations is discussed including patients with coronary bypass graft surgery, peripheral vascular disease, cerebrovascular disease, and structural heart disease. Management of antiplatelet therapy in patients who require anticoagulation is a particularly challenging clinical setting and is the topic of a featured review. Finally, adverse drug effects and reactions are examined in a section highlighting clopidogrel resistance, clopidogrel hypersensitivity, and bleeding complications. 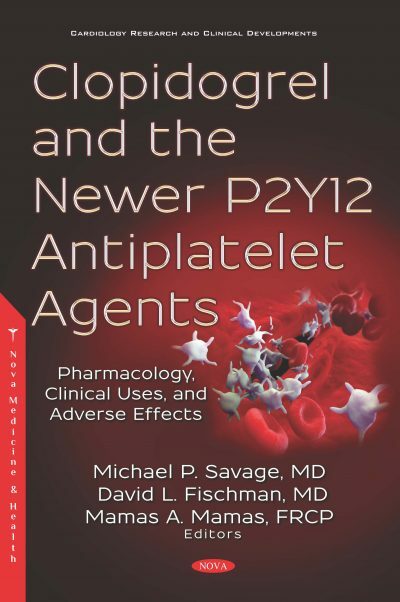 This book is designed to provide a comprehensive review of clopidogrel and the newer P2Y12 inhibitors. Towards that end, the authors have enlisted an internationally renowned group of experts as contributors. It is intended to be a resource for clinicians, scientists, pharmacologists, and all healthcare professionals involved in the management of cardiovascular disease.